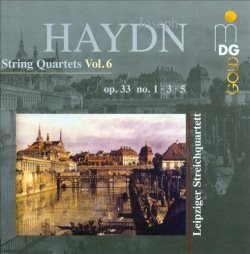 The Leipzig String Quartet continue their cycle of Haydn string quartets with this sixth installment, which presents three of the six Op. 33 quartets composed in 1781. According to the booklet notes, ten years had elapsed between the completion of his last set of string quartets (the Op. 20 “Sun” Quartets) and these. The Op. 33 quartets were also the first works that Haydn was permitted to offer for sale to a publisher, his contract with the Esterházy court up to that point having precluded him from being able to do so. Motivated at least in part by the prospect of making a profitable success, Haydn produced a set of quartets that combined musical sophistication with compositional elements including use of the rondo form. These were intended to make this music popular with the public. Those quartets also introduced the scherzo movement as a replacement for the more traditional minuet. There is no doubt that the Leipzig String Quartet gives technically solid, musical performances. Intonation and ensemble throughout are excellent, as can be expected from musicians that have been performing together for more than 25 years. In general, they use vibrato selectively and follow all repeats. Their reading of the slow movements is beautiful. Where I found their interpretations wanting, however, was in a relative lack of dynamic contrast and an overall smoothness to their playing in the outer movements, which tended to make the music less involving. A comparison of their approach to the Op. 33, No. 3 “The Bird” with that of the Jerusalem Quartet illustrates this point. In the first movement, the quicker tempo of the Jerusalem Quartet provides greater sweep and momentum, and a closer attention to use of dynamics give the reading more interest. Furthermore, listen to the Jerusalem Quartet’s crisp articulation and sharpness of attack in the final Rondo, which simply defines its performance with more conviction. Nonetheless, there is still much to be enjoyed here, and these performances by the Leipzig String Quartet are likely to please their fans. Sound quality is characteristic of MDG – clear, natural, and balanced.